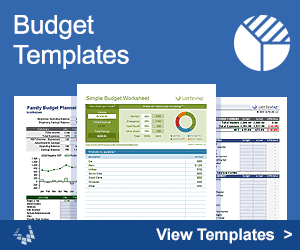 Download a Free Home Equity Loan Calculator for Microsoft® Excel®. Our Home Equity Loan Calculator is actually an Excel workbook that consists of 3 different home equity calculators. They will help you answer the following questions: (1) How much money can I borrow? (2) What will my monthly payment will be? (3) How much home equity might I have in 5 years? A home equity loan is basically just a "second mortgage". The terms are often used interchangeably, and almost any mortgage calculator can be used for a home equity loan. This calculator evaluates a fixed-rate loan, with optional extra payments (which you set up to simulate accelerated bi-weekly payments). If you need an adjustable rate mortgage calculator, you can try the ARM mortgage calculator. If you are looking for a home equity line of credit calculator, try our HELOC calculator. This Excel workbook is a feature-packed spreadsheet that lets you calculate your monthly payment on a fixed-rate home equity loan. It creates an amortization schedule and allows you to either set up periodic extra payments, or manually enter prepayments in the payment schedule. - Use the Home Equity Calculator worksheet to estimate how much money you can borrow based upon what you still owe on other mortgage(s) and loans. How much home equity will I have N years from now? - Use the Home Equity Loan Calculator worksheet to answer this question, based upon the current value of your home, the appreciation, and the balance of one or two fixed-rate mortgage loans. The HomeEquity worksheet (the 3rd tab in the workbook) lets you calculate the amount of equity in your home after a number of years. Although it is limited to analyzing fix-rate mortgages, it can be very handy for analyzing your current state, and making useful predictions in case you want to sell your home later. How many years will it take to pay off each loan? I want to sell my home in 5 years. How much will equity will I build up by then? It doesn't matter whether you've made prepayments in the past, you just enter the current balance, the annual interest rate, and your monthly payment (not including taxes and insurance). Unlike other home equity loan calculators, this one lets you include your 1st mortgage and your 2nd mortgage (or a home equity loan). It will work for interest-only mortgages (assuming a constant rate), and if you enter a monthly payment larger than the normal amortized monthly payment, it assumes that the extra payment is going towards the principal. The LoanCalculator worksheet (the 1st tab in the workbook) is very similar to our home mortgage calculator. That is because a home equity loan is (usually) just a second standard fixed-rate mortgage, as opposed to a HELOC or Home Equity Line Of Credit which is a different thing altogether. 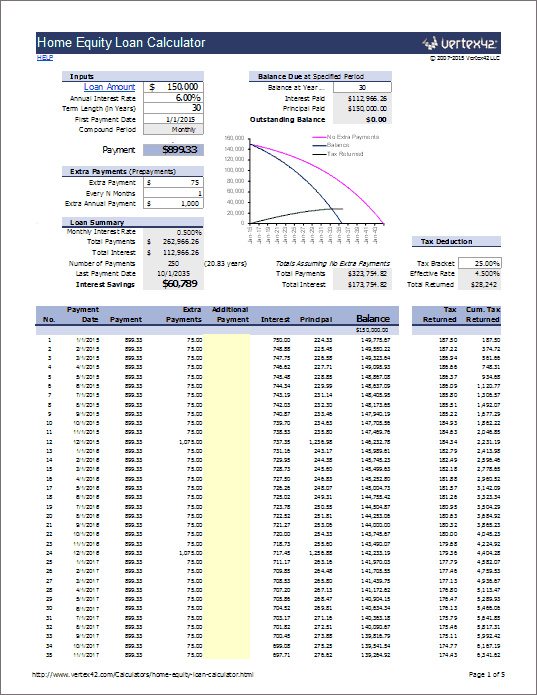 The Loan Calculator worksheet creates an amortization schedule and lets you experiment with how extra payments can help you pay off the loan early and save interest. The Home Equity Loan Calculator can be used for estimating the interest savings from accelerated bi-weekly payment plans. Normally, making bi-weekly payments on a home equity loan or mortgage is a convenience that a lender may offer in case you want to coordinate your payments with your bi-weekly paycheck. It is also a way to consistently make extra payments to pay off your loan earlier. Usually, the bi-weekly payment amount is half of the normal monthly payment, which means that you are also paying extra principal, because you make 26 payments per year. In the home equity loan calculator spreadsheet, you can simulate this by making an extra payment of Payment/12 each month, where Payment is the normal monthly payment. The calculations will be very close to reality, as long as your lender doesn't charge you fees for making prepayments. But, the amortization table probably won't match exactly what your lender provides. Home Equity Calculator : at MSN.com. This calculator includes the appreciation of the home, but only considers a single mortgage. Home Equity Lines of Credit at FederalReserve.gov - an excellent read! Disclaimer: We believe the calculations in this spreadsheet to be correct, but we do not guarantee the results. Because your personal financial situation is unique, you should probably consult your financial advisor, accountant, and lending institution before making any financial decisions.